Black Rock City’s Department of Public Works (DPW) had an amazing year in 2009, again tightening up operations and putting new processes into play, while continuing their excellent track record of safe, fast-paced city construction. DPW hosted a small number of work weekends in 2009, holding just six in the pre-season and two post-event for playa restoration. The result was once again a high attendance rate, and a more focused set of tasks to accomplish. Work weekends have continued to be an essential part of the pre-event work season, as well as a proving ground for new applicants to the DPW crew. DPW Shade Crew for the 2009 build season. DPW’s pre-event crew size was 220 hands, and was almost entirely returning crew. Of the new faces, almost all came to the DPW with prior experience on a Regional Event’s build team, which added a healthy amount of experience and fresh energy to the crew. In an effort to optimize our build schedule, a more deliberate effort was made this year to stagger the arrival dates of the crew, taking some of the pressure off of Gerlach while the crew prepared to move out onto the playa. Clear pounding in t-stakes for perimeter fence. In addition, the DPW’s time on the playa was extended by four days this year, taking a great deal of pressure off of the build timeline. While Black Rock City has grown over the past few years, and the construction of the city has grown as well, the timeline for the build has remained static. Having the extra time on site changed the tone of the build considerably, allowing for a safer, more thorough build. Each team still operated under a tight schedule, but the timeline for 2009 had just enough breathing room in it to be a luxury. Going forward, retaining this timeline is going to allow for DPW to streamline all of its build processes, and make improvements to the build schedule as a whole. DPW’s Manager On Duty scheduling system, launched last year, continued to be an effective way of distributing responsibility and time off throughout the event week. No one manager was overburdened, and it gave several DPW project managers more responsibility during the event, as well as a larger perspective on Black Rock City. 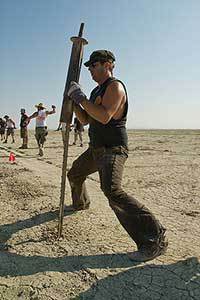 As the event site was scaled down in size from 2008, the Playa Restoration crew size was also scaled back to 75 core team members and 25 support staff. 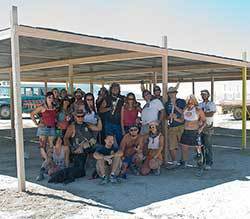 This year marked the first year that the Playa Restoration crew has had to turn away a significant number of people, since there were too many folks who wanted to help than the infrastructure could support. Volunteers signing up specifically for Playa Restoration has become a regular occurrence; new faces were still added to the mix post event, as well as former crew members who had skipped this year’s build. This too is proving to be an essential part of the process, keeping the energy fresh, and morale high through the long post-event season. The Department of Public Works continues to improve its operations each year, both as individuals and as a workforce. The 2009 crew was DPW’s most successful assembly yet, meeting the challenges of the year with enthusiasm and determination, and providing a shining example of a strong, capable, professional construction team.